Man, 2017 was bonkers, and not just because of politics and the constant need for vigilance. 2017 was a unique year for me – it was the first year I ever got laid off from a job because of a retail store closing. It was the first year since I lived in Arizona where I tried to make a living off of freelance income (including but not limited to: making comics, selling comics at conventions, commissions, and other art-related paid work). This year also marked the first time I ever worked at a doctor’s office, and of all the doctor’s offices I work in, I work in a family practice that sees suboxone patients. For those of you who don’t know what suboxone is – you know how there’s an opioid crisis in the nation? Suboxone is the drug you give to wean patients OFF narcotics like opioids. I could talk for days about that office. Anyway, 2017 was also the year I got more involved in community action and organization – I joined my local Indivisible chapters and started Beyond the Rainbow, an LGBTQ advocacy group serving my area, because such a group didn’t exist. In comics, this was a BIG year indeed! Before this year, I was lucky to get to 3, maybe 4, conventions and shows to sell my work in a given year. The How to Make a Mini-Comic Workshops went well this year. Some workshops had only a handful of attendees. Others I did for entire Girl Scout Troops. Even though the attendance per workshop fluctuated wildly, they were still fun to run. Plus I helped give people the tools to make their own tiny comics and zines. Slowly we are amassing an army of creative comickers! Also (and I haven’t talked very much about this with people online, not even on Patreon) – I got a pitch ready, along with Christian Beranek and Tony DiGerolamo, for a potential comic project. Both writers brought me on board to be the artist. I hope our project gets picked up! 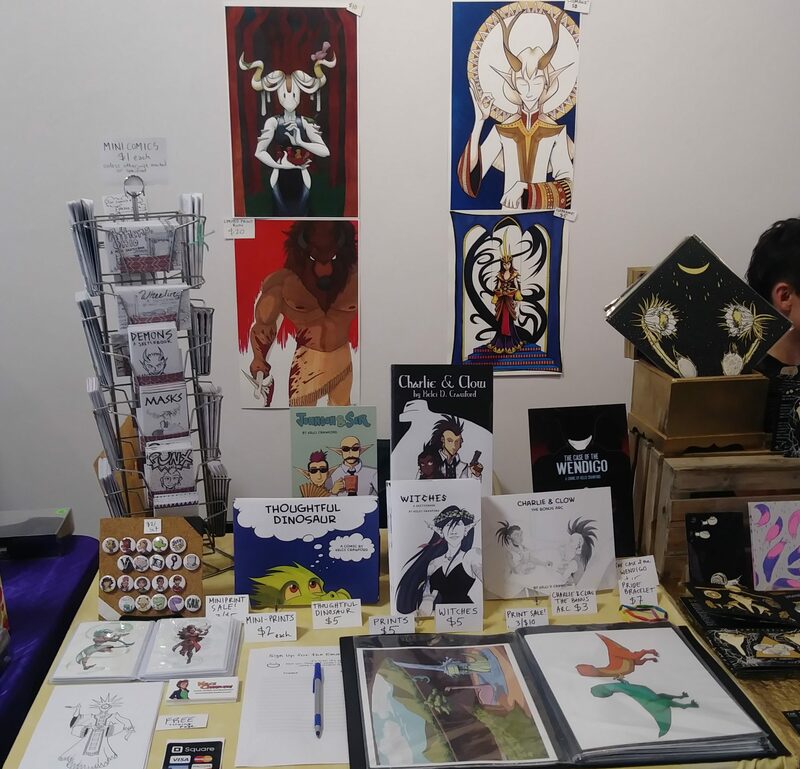 Also this year, new zines and mini-comics were printed, Validation buttons and a sketchbook were printed, The Case of the Wendigo and Validation kept going strong, and Witches: The Sketchbook became my 6th book taken to print! There were also new prints, like The Forest Spirit and (still on sale) God. As another sign of growth, I now have comics available in more shops! Not just Storenvy or Quimby’s – like, now there are comics of mine at the Book Loft in Columbus, OH, and a handful of other places listed here. Plus, back in April, I did the single most important thing I ever did, not only for my comics career, but for my well-being… I deleted my Twitter account. As a result of all this hecking banana-pants running around, though, blog posts have been lacking. I feel like I could do a better job of keeping y’all in the loop, and if you’re an email newsletter subscriber, that’s definitely the case. The email newsletter updates once a week with details about what we’ve accomplished this year. I’m glad for the successes of this year. I genuinely am. However, I would not have made it this far if it weren’t for readers like you – the folks who read my comics, subscribe to my newsletter, support me on Patreon, and back me on KickStarter. I mean it when I say You. Are. Awesome. Well, stay tuned – in the next few days I’m preparing a short survey so I can gauge what platforms (Facebook, KickStarter, Patreon, etc) you like to engage with me on, and what you would like to see more of in 2018. When the survey is ready, I’ll be announcing it on Facebook, Tumblr, here on the blog, in the email newsletter, and on my Patreon page. When the survey is ready, please do me a favor and fill it out to the best of your ability. Your feedback really helps. Thank you so much for your support during 2017! I think 2018 is going to be great. Glad to hear from you. I was overdue for an update. Wish we had caught up over the holidays but maybe soon. Love Ya lady! Oh I know. Updates have been long overdue. Love you too.